Multi-position jaw. Quick release trigger. Removable soft pads. 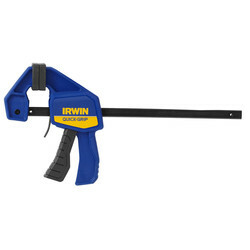 Irwin Quick Grip Mini Clamp 150mm is rated 4.8 out of 5 by 53. Rated 4 out of 5 by Klokkie from Great value for money Already has a few of these, and they are good value. Not the strongest clamp, but great for the smaller jobs. Rated 4 out of 5 by Anonymous from Great little clamps A chap can never have too many clamps, but these are particularly useful for all those quick jobs, holding a workpiece down on the bench or on the drill table. Quick and easy to use, 1-handed, with enough clamping force for these types of job. Rated 5 out of 5 by Evlar from Versatile clamp Bought 4 clamps to repair an acoustic guitar that had been damaged in transit - part of the back had separated from one side. The glue needed 4 hours to set and each clamp was easily fitted with one hand while holding the joint in place. ideal for this type of repair.